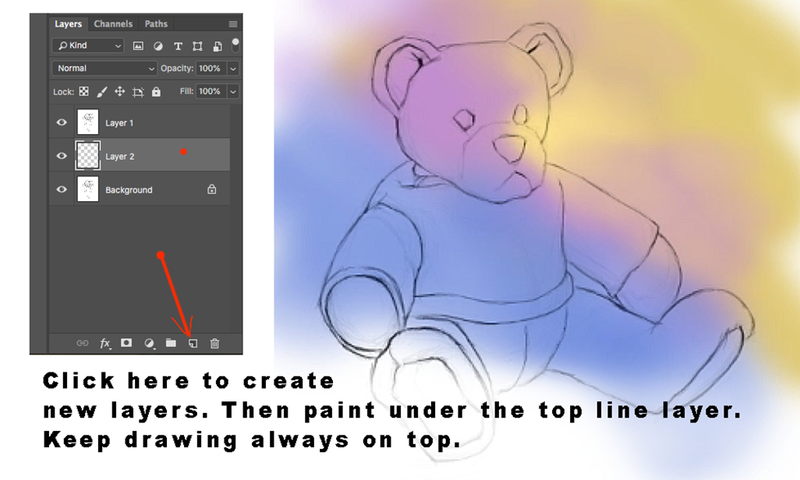 Paint digitally with Photoshop and gain another level of creativity. 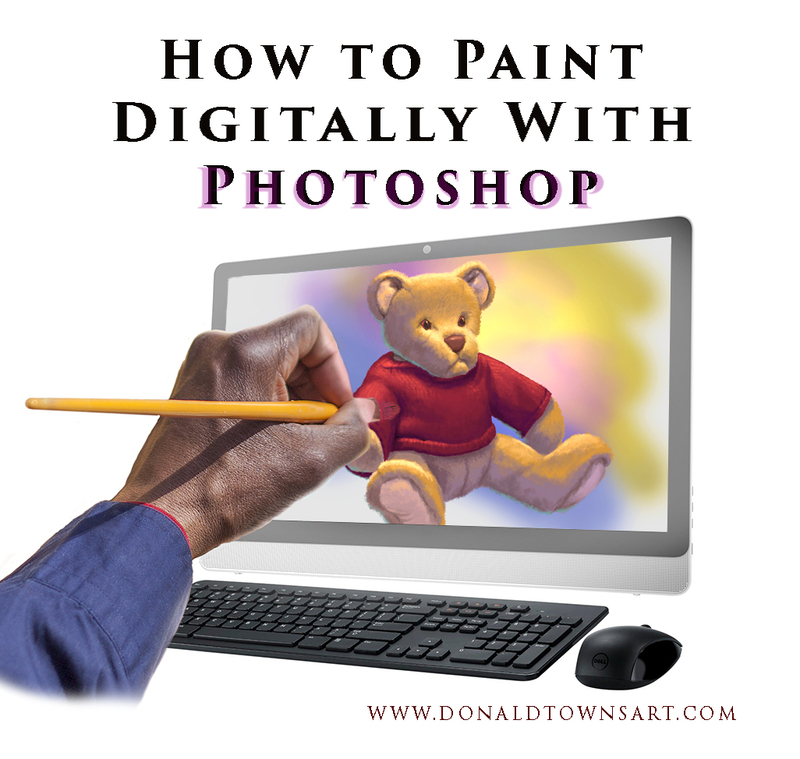 Learn how to paint digitally, adding to your Photoshop skills which will expand your creative expressions. Sometimes people think that when you paint digitally on computer all you do is push a button and the computer does the painting. Not so. It’s the artist that’s doing the painting. 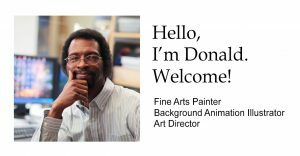 The only difference is the artist is using the computer brushes and color as opposed to regular paint and brushes. Come along and I’ll show you the process of how we actually paint digitally on computer. Hope it’s something you can actually learn from. I start with a digital drawing I did on my computer. Or you can use an imported file of a drawing you have. 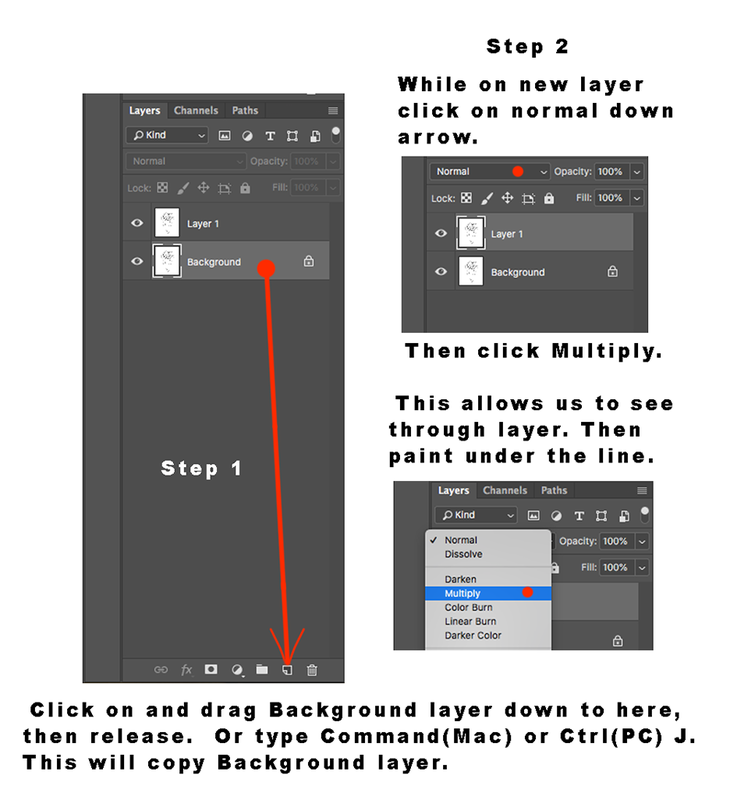 I duplicate my drawing using command (Mac) or Control (PC) J to duplicate another layer of the drawing. Then hit multiply to see through that layer. This keeps the line on top of the painting at all time to see what you’re painting. 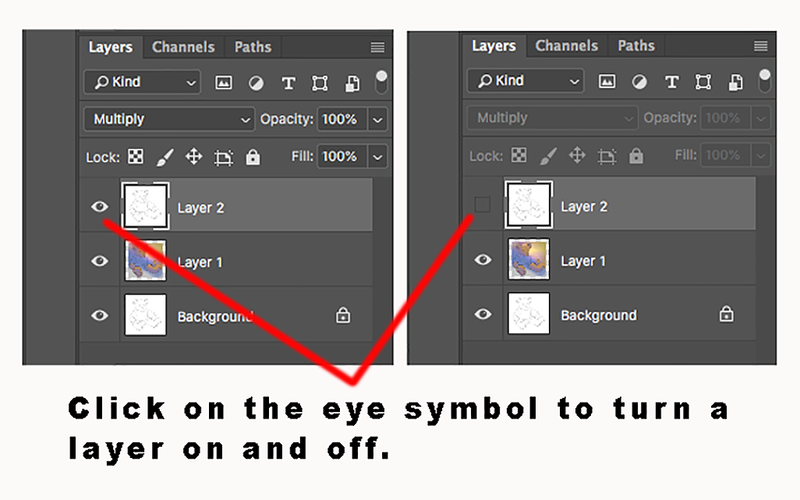 I create a new layer (click on copy symbol at bottom right corner) underneath the line layer. Here I paint digitally under that line layer. Starting with my background. Each added object gets it’s own separate layer. This make it easier for corrections or adjustments without affecting the other elements. 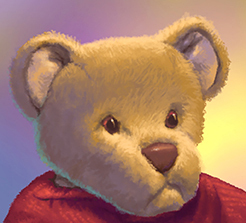 When I start painting the bear on computer I used a textured brush called Dry Brush on Towel. That gives me a furry look. Determine which direction your light will come from. Paint in his basic color then some shadow colors. It’s a little brighter than what I want so I toned it down. 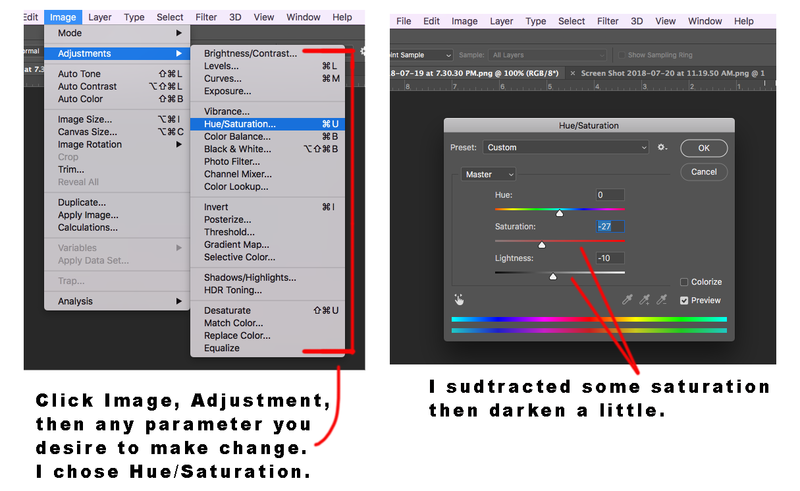 (While on the layer click Image, Adjustments, Then any parameter you desire to make a change with). I’m giving light to the top areas as if the light is coming from above right side. I’m filling it in to give dimensionally to my basic structure and I’ll fill in additional spots as I go. I turn off my top line periodically to check how well the structure of my drawing is coming along. Then turn it on again. I put in the sweater color quickly. Then go back and erase some of the color that’s outside the line. If you remember one of my previous video/blog (Artist Technique for Painting a Tree) on simple painting steps of 1,2,3 – dark, lights, and medium tones. I’m painting with this idea in mind, as I add in my lighter tones on the sweater. I’m going to tone the sweater down, using a Layer Mask to darken it then I’ll erase out some of the darks so the lights will come through. 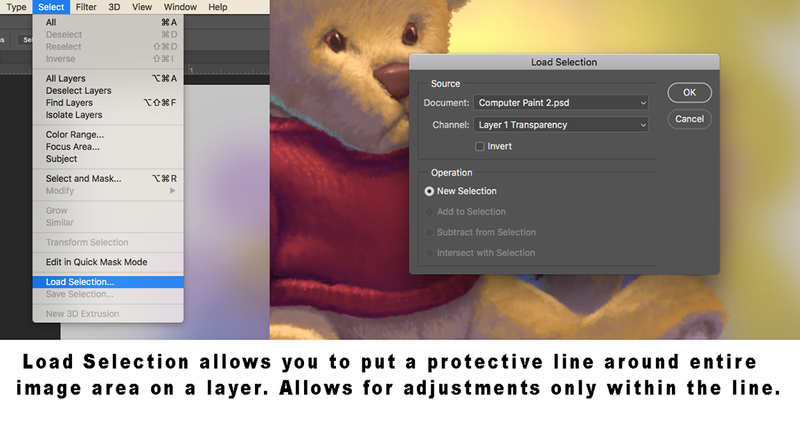 A Layer Mask or Adjustment Layer allows you to make a layer to change the artwork without affecting the original art underneath. Such as complete color or effect changes, even erasing things out while the original remains in tack. 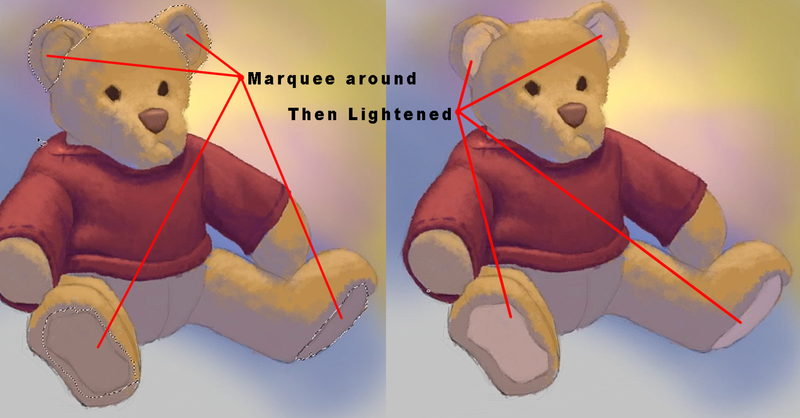 You can affect the entire work or isolate out an area with a marquee or protective line around it (Painting With Photoshop On Computer). Then create the mask. Here are the steps. 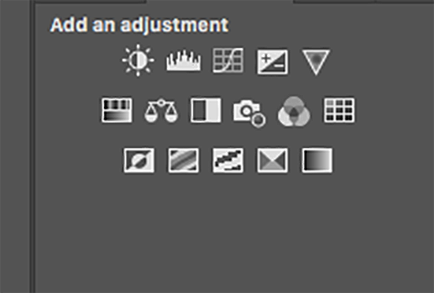 Or, while on the layer you want, click on Select, Load Selection, then OK.
Then choose from Adjustment layer you want. Hover over then to see what they are then click the one you want. Layer will appear and the window to make changes. Use them to adjust what you want. I will give more color to my shadow areas. Darker in the dark areas on the sweater. Has a bit of violet touches to it and then I’ll darken it even more and erase some of the mid tones. (Please watch the video for visual clarity). Now I’m building some of the features, the nose, the eyes, putting in a little more detail as I go. On the video you’ll see me going in tight and out of the painting some times. I need to push it back to see how it comes together when its too close. Then I pull it back in to see more of the details. If it was an actual painting outside of the computer, I would be stepping back from the painting. I’m putting a Marquee around the feet and ears to lighten them up more. Then add line details. 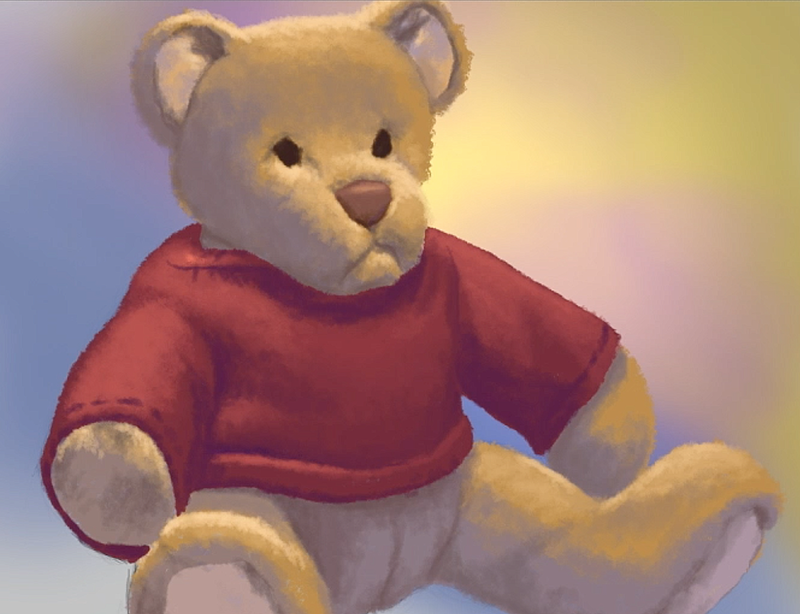 The line drawing is there as my foundation to build the bear painting. I need to paint line detail on the bear to allow it to stand alone when the top line is removed. 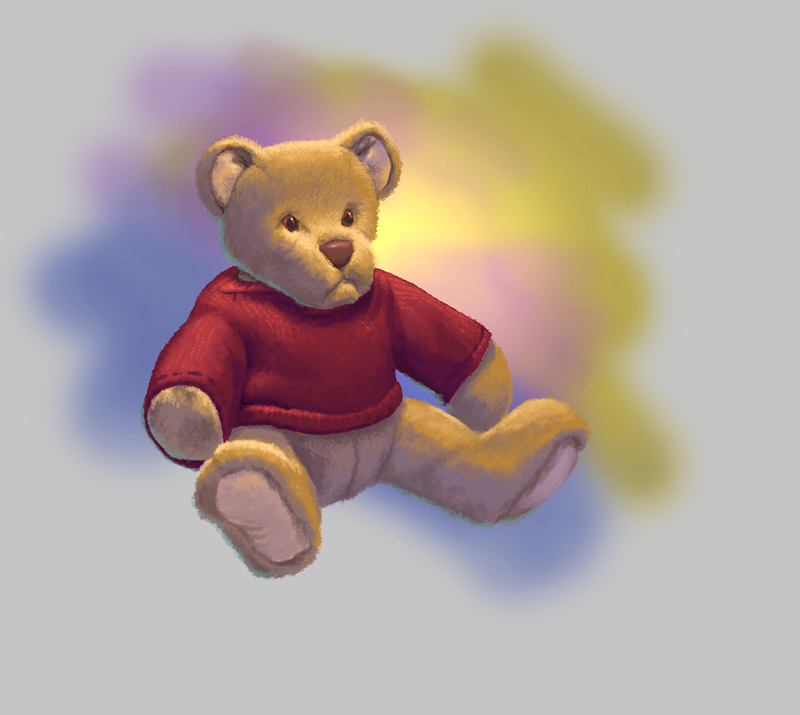 I build form, giving value, texture, and other details to the bear giving dimensionally with light, middle tones, and shadows. This applies when you paint digitally on computer or painting on real canvas. I paint a little in different areas to help build more of the form overall as I go. Painting some areas a little lighter, some areas a little darker. I’m building the eyes now. Painting in some eye color. I decided to brightening up the eyes more with an adjustment window. Because they are on their own layer I can adjust the color from a window and not use the Layer Mask if I’m not concern about preserving an original color. 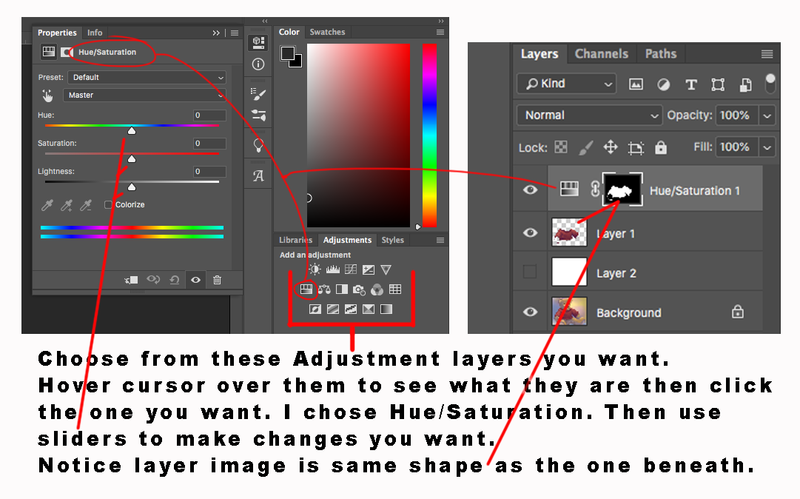 If you refer to my blog (Painting With Photoshop On Computer) I’ll explain about finding the brushes window, where to pick colors and a few other Photoshop basics for painting. 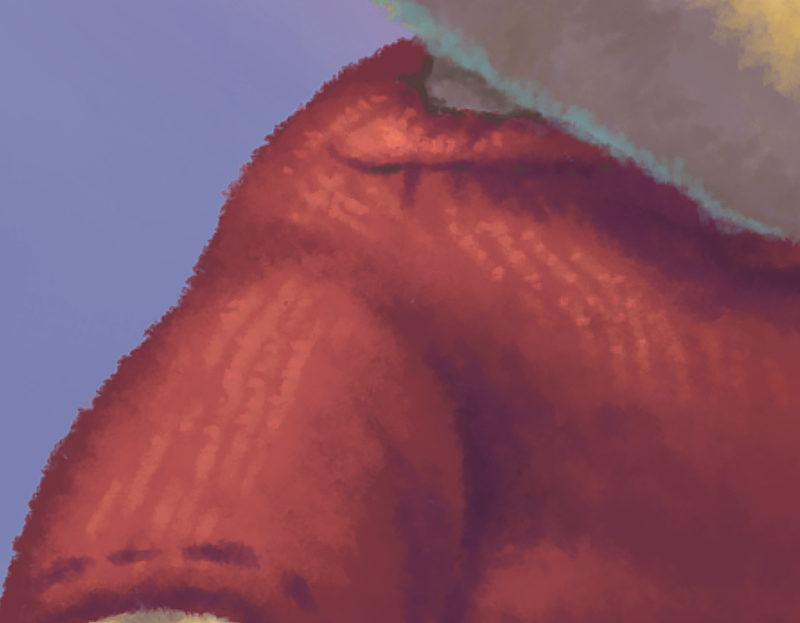 Here I’m putting in reflective light just to give more color emphasis and now I’m coming in and trying to give more texturing to make it have a sweater effect, without putting every line. I’m just putting in light hitting is as opposed to the shadows to give it that sweater feel. I darken a few lines here and there to help accentuate form better. 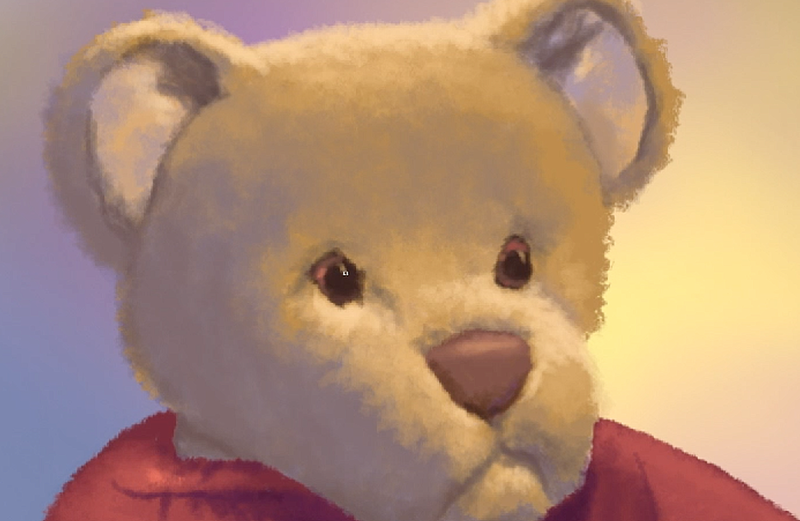 Now I’m giving more textures to the bear. I want him to feel more hairy but not overly so. Trying to simulate a look without giving every single detail. 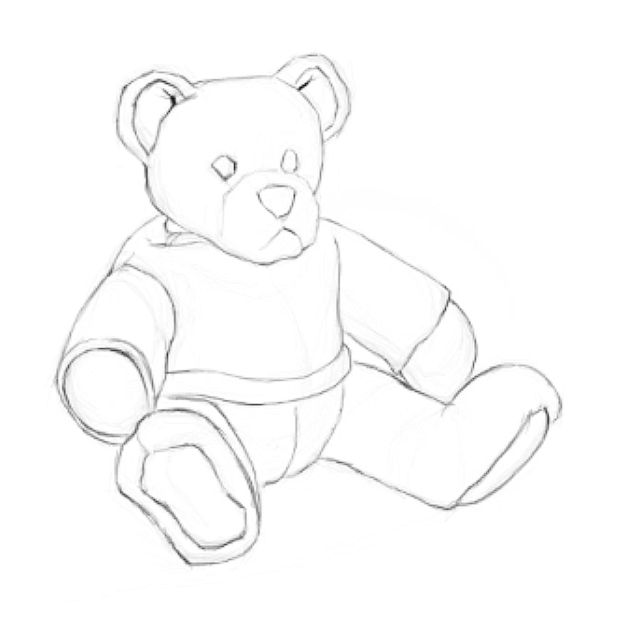 This will give him more of a “toy bear” texture. Bringing a little more light in areas. This is me doing the painting on computer. It requires my artistic eye to know where to give more detail without giving too much detail. So here’s the final. Now it’s your turn. Fire up the computer, open Photoshop and give it your test run. Just play a little and make it fun! As the animation industry was moving to computer, Photoshop was becoming the software to paint with for background painting. Before the transition from traditional painting to computer was fully in swing, I give myself 30 minutes before my normal start work time and 30 minutes after work hours to learn how to paint digitally on computer. It didn’t take very long to get in the flow of it so long as I was consistent in my effort. So lets do this. I Hope this was a learning experience for you.